Mission Statement The purpose of Golden Bone Rescue & Rehab, Inc. is to rescue and rehabilitate abused, neglected and abandoned domestic pets from the Verde Valley area. We are a no-kill, non-for profit 501(3). Services and Projects Golden Bone Rescue & Rehab, Inc. supports spay/neuter of all domestic pets as well as getting medical attention for domestic animals in need putting abused/neglected animals in safe homes until they can find their forever homes. $1000 needed for materials and labor to enclose rehabilitative space for The Phoenix Four. The four rescue dogs are urgently in need of rehabilitation after being put through several years of trauma. These dogs belonged to a disabled veteran who developed dementia and passed away, with nobody to care for his dogs. The Phoenix Four were rescued and are being taken care of by members and volunteers of Golden Bone Rescue, but they need your help. 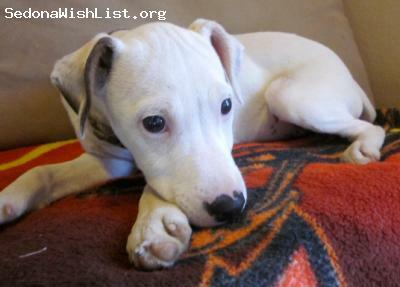 Your funds will also care for future special needs dogs and senior emergencies. Thank you in advance for your generosity. Golden Bone continues to seek foster homes for dogs. Golden Bone does not have a facility, so all of our dogs are tended through foster care. We provide food, advice, and medical care, while approved fosters provide space, safety, and love. Happily, Alice, Meemee, and Gracie have found foster homes for now. We still need one with a secure and high fence for Mary Jane. Mary Jane is a 66-pound hound mix who absolutely loves to play with dogs; however, she needs a polite and gentle introduction with other big dogs, and time to get to know them first. Once she is comfortable, her true doggie play style is very fast, and a bit on the alpha side. Golden Bone is desperately seeking foster homes for dogs. At the top of our list right now are homes for the following: Alice is a 14-16 week-old female Lab mix who was discovered locked in a closet when a caretaker visited one of her clients. She is a lively, bubbly, curious little girl. She is very social with both people and dogs. MeeMee is a young, well-behaved, house trained and very sweet pregnant Shih Tzu. She needs an experienced foster home able to keep her and her babies through weaning, which will be about eight weeks. Mama dog will be spayed and returned to owner, and puppies will be adopted through Golden Bone's procedure. 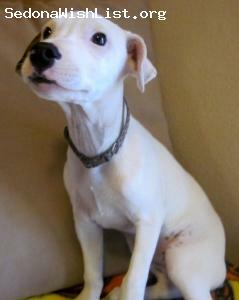 Gracie, a Greyhound/Lab mix, is shy at first but warms up quickly to people and other dogs she does not know. She loves to walk on the leash. She is good around kids and dogs. Golden Bone Rescue is working to raise several hundred dollars for Emma, a Bernese Mountain dog with hip dysplasia. Treatment plans include a course of adequan which will allow us to postpone surgery until we can strengthen her back and legs. The first month will consist of loading her up once a week with the shots which cost around $50, then taper off to a monthly shot until we can evaluate for surgery. Without treatment she will not have the ability to bear weight on her back legs in 18 months to 2 years. We have a fantastic rate for the surgery of $400 but we want to get her strong and sturdy first. Golden Bone Rescue needs an outdoor kennel for one of our foster dogs. Minimum measurements should be about 5feet by 8 feet and 6 feet high. Golden Bone Rescue will be participating in the 2nd Rummage For Rescue hosted by Red Rose Inspiration. The event takes place at the Olde Sedona Bar and Grill on April 12 from 9 a.m. to 3 p.m. If you have some rummage-type items you’d like to clear out of your home, please consider donating them to us to help us raise money for our foster dogs! We’ll arrange for pick-up and we’ll consider most anything that is salable, clean, and in working order. From past experience, we’ve learned we don’t need used clothing and shoes (unused is great), electronics, vases, and Christmas things. Golden Bone Rescue is looking for a reliable smallish (dorm-size) refrigerator so that we can safely store vaccines for our dogs. Golden Bone Rescue and Rehab recently took in four dogs that need shots and spay/neuter and agreed to provide the same veterinary expenses to the remaining three dogs in the household. We are in desperate need of funds to address this group of dogs along with all the others which continue to gallop through our gates. No donation is too small. Golden Bone Rescue and Rehab desperately needs donations to cover the cost of spay/neuter. We have depleted our funds taking care of numerous dogs in the past few months. Any amount is greatly appreciated. Golden Bone Rescue and Rehab has recently acquired six dogs and a parrot whose owners recently died. These animals need veterinary care including spay/neuter and immunizations. Any donations to help defray our costs will be greatly appreciated.